Śaucam means cleanliness, not only in mind and body but in one's dealings also. It is especially meant for the mercantile people, who should not deal in the black market. 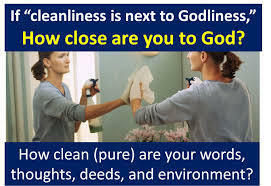 Cleanliness is essential for making advancement in spiritual life. There are two kinds of cleanliness: external and internal. External cleanliness means taking a bath, but for internal cleanliness one has to think of Kṛṣṇa always and chant Hare Kṛṣṇa, Hare Kṛṣṇa, Kṛṣṇa Kṛṣṇa, Hare Hare/ Hare Rāma, Hare Rāma, Rāma Rāma, Hare Hare. This process cleans the accumulated dust of past karma from the mind. One should always be careful to keep his body clean by bathing, brushing teeth, changing clothes, etc. As far as internal cleanliness is concerned, one should always remember the holy names of God and chant Hare Kṛṣṇa, Hare Kṛṣṇa, Kṛṣṇa Kṛṣṇa, Hare Hare/Hare Rāma, Hare Rāma, Rāma Rāma, Hare Hare. The demons neither like nor follow all these rules for external and internal cleanliness. cleanliness is necessary both for the mind and for the body. Simply bodily cleanliness may help to some extent, but cleanliness of the mind is necessary, and it is effected by glorifying the Supreme Lord. 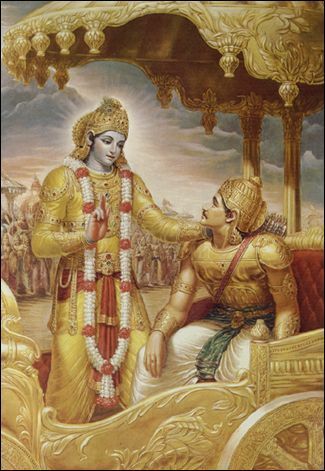 No one can cleanse the accumulated mental dust without glorifying the Supreme Lord. A godless civilization cannot cleanse the mind because it has no idea of God, and for this simple reason people under such a civilization cannot have good qualifications, however they may be materially equipped. We have to see things by their resultant action. The resultant action of human civilization in the age of Kali is dissatisfaction, so everyone is anxious to get peace of mind. This peace of mind was complete in the Satya age because of the existence of the above-mentioned attributes of the human beings. Gradually these attributes have diminished in the Tretā-yuga to three fourths, in the Dvāpara to half, and in this age of Kali to one fourth, which is also gradually diminishing on account of prevailing untruthfulness. By pride, either artificial or real, the resultant action of austerity is spoiled; by too much affection for female association, cleanliness is spoiled; by too much addiction to intoxication, mercy is spoiled; and by too much lying propaganda, truthfulness is spoiled. The revival of bhāgavata-dharma can save human civilization from falling prey to evils of all description.